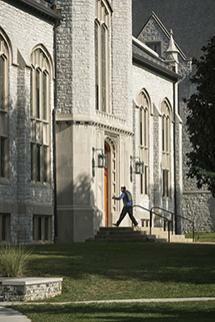 Located in Chambersburg, Pennsylvania, Wilson College’s campus has gracious lawns, mature trees and rolling hills. The beautiful 300-acre campus is on the National Register of Historic Places as a historic district and the Conococheague Creek runs through it. 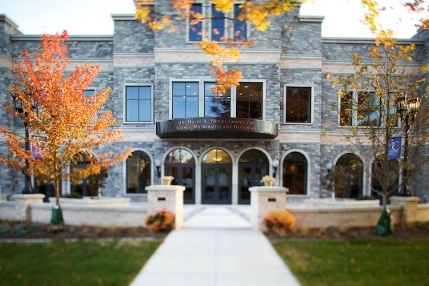 Six buildings serve as student housing and there are several facilities for athletics and equestrian com­petitions, including three athletic fields (field hockey, soccer and softball), tennis courts and a gymnasium. A dance studio is housed in Lenfest Commons, students also have access to the fitness center. The Penn Hall Equestrian Center has three, 24-stall barns; two indoor arenas and an outdoor arena; cross-country jump course and turn-out fields. The College also provides complete equine-facilitated therapeutic facilities and equipment. In addition, Wilson College has an organic farm—the heart of the Fulton Center for Sustainability Studies— that allows a wide range of opportunities to learn about approaches to sustainable living. In January 2009, the College opened the new $25 million Harry R. Brooks Complex for Science, Mathematics and Technology, the first Gold LEED-certified building in the area. With state-of-the-art classroom, laboratory and research spaces, the Harry R. Brooks Complex for Science, Mathematics and Technology represents a vision for the future of the liberal arts and sciences at Wilson College. Flooded with natural light and filled with leading-edge technology and equipment, the building offers spaces that enhance teaching and learning, and the practice of science at the undergraduate level. The building has transformed the campus and is changing the lives of our students and faculty. We invite you to learn more about it on these pages, or visit campus and take a tour. Envision the future of science at Wilson College and join us in this important educational mission.